Happy Tuesday y’all! This week’s topic is “Top Ten Yummy Foods Mentioned In Books.” I’ll be honest with you, I don’t usually notice food in a book. So I’ve tweaked this week’s topic to my share my favorite recipes from Pinterest. I’ve gotten to where I use Pinterest SO much for recipes that I don’t even use recipe books anymore, or when I do it’s rare. As always these are in no particular order and link to the original recipes. 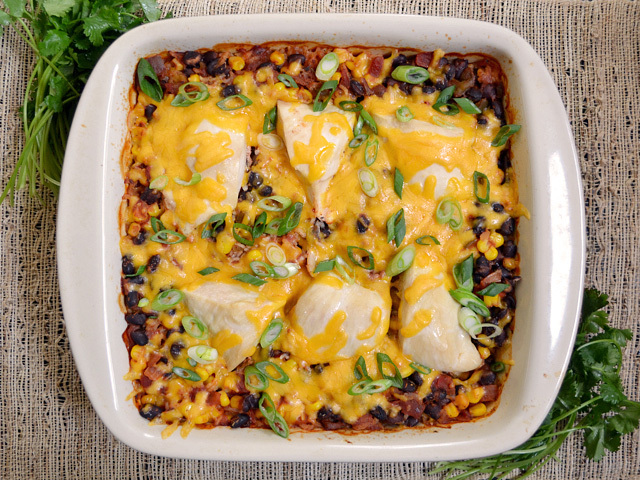 Salsa Chicken Casserole via Budget Bytes: This is one of our favorite one dish recipes. It is quick and easy to make AND (if like me you are cooking for two) can be divided into multiple pans and frozen uncooked (minus the cheese) to make another day. Seriously this is awesome!! When we make it I usually use either chicken tenders or cut the chicken into strips so you have chicken throughout the casserole. 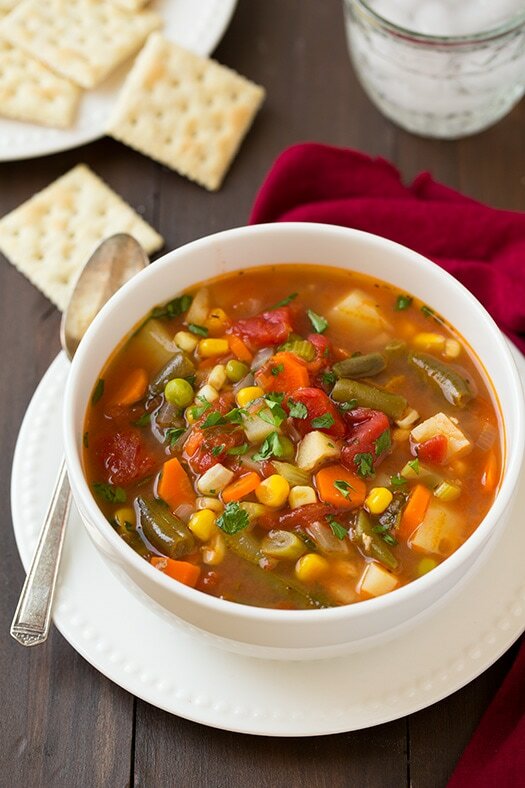 Vegetable Soup via Cooking Classy: My husband bought me one of those porcelain coated, cast iron stock pots this summer and I’ve used the heck out of it since. Most of my recipes have come from Cooking Classy too. I’ve made vegetable soup for years in the crockpot using my mom’s recipe which consisted of mainly canned or frozen veggies. This recipe uses ALL fresh ingredients and I do mean all. I even cut the corn off the cob to add to the soup. My husband said it was the best soup I’ve ever made. Also it froze well. He had a cup last week that I’d frozen from the leftovers. Very flavorful and only took about an hour to simmer. Southern Milk and Honey Corn on the Cob via McCallum’s Shamrock Patch: Y’all if you like corn on the cob, make this recipe this weekend. It is delicious!!!! This recipe is why I got my stock pot 😀 I made this at Mother’s Day for my husband’s family. I had none leftover! I’ve made it several times this summer and every time I’ve made it I get the same response: “What’s your recipe?” “Can I take some home?” “Aw…the corn’s all gone!” Y’all this is some seriously good corn! Homemade Biscuits via Scratch this with Sandy: I’m always looking for a good biscuit recipe. I love homemade biscuits on the weekend or with soup. These are particularly good. In fact they may even be better than my grandmother’s (but I’ll never tell her that!). The only change to this recipe that I make is that I use buttermilk for half the milk in the recipe and the other half regular milk. Make sense? These are so light and fluffy! I’ve even subbed in butter for a portion of the shortening to make them flakier. 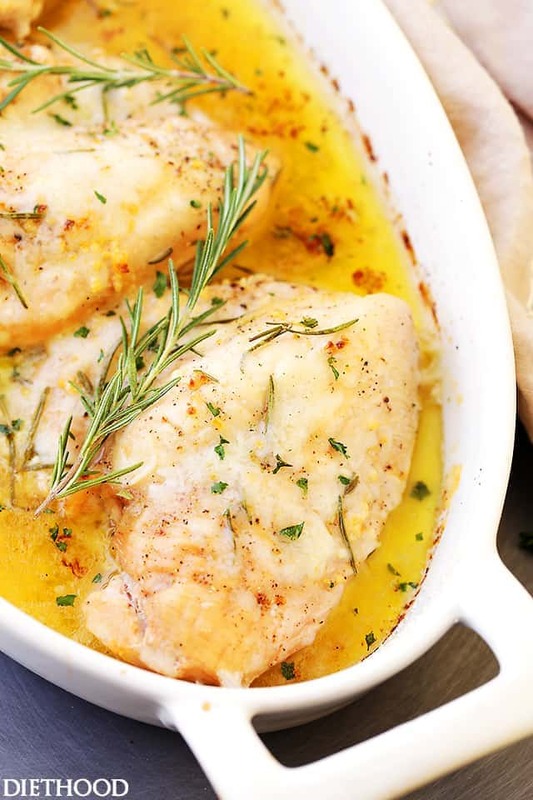 Baked Garlic Butter Chicken via Diethood: If you like your chicken to be tender, juicy, and falling apart, this is the go-to recipe right here! I’ve made this using a whole chicken in the crockpot before (leaving out the cheese, adding onion and increasing the other ingredients accordingly). Y’all this chicken is SO good. We use fresh rosemary from our garden and a ton of garlic, sprinkle the cheese and serve. My husband likes this dish with mashed potatoes and roasted green beans. Baked Pancake Squares via Fabulessly Frugal: I’ll never make pancakes the old fashioned way again! These are delicious and super easy. I get these mixed up and in the oven. While they cook, I do the eggs and bacon and once it’s all finished the squares are done and ready to eat. Plus this makes a great breakfast to make ahead. I’ll make this on Sunday night for Brinner (tell me we aren’t the only ones to enjoy breakfast for dinner?! ), doubling the recipe. That way we have enough for breakfast during the week before school. They warm up great and taste just as good as they do fresh out of the oven. 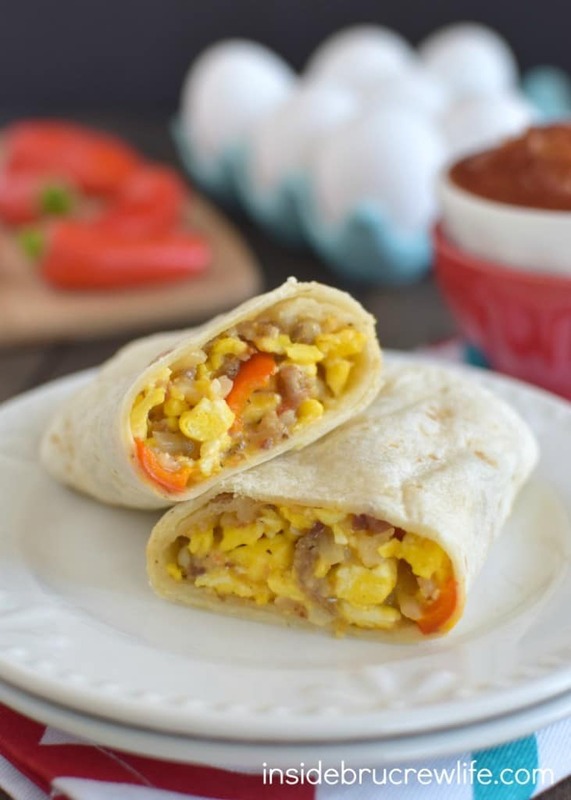 Loaded Egg Burrito via Inside Bru Crew Life: Another breakfast favorite. This is a versatile recipe once you get the hang of making them. We’ve made many different versions adding different meat and veggies. These freeze well and will make anywhere from 10-18 (depending on how much you fill them). Wrap in a moist paper towel and warm them up in the microwave for 1.5-2 minutes. Perfect for breakfast on the go! White Chicken Chili via Lil’ Luna: This is a great chili recipe! I almost always make this after we make a roasted chicken because we always have so much chicken leftover! I’ll take the left over chicken and shred it, adding it to this recipe. We add a can of white corn as well for additional flavor and a little sweetness. Basic Pizza Dough via The Complete Savorist: We make a LOT of pizza in this house. It’s about the only thing my son will eat, and if it’s on a pizza he’ll eat it. So I spent a long time trying to find a good recipe. This is perfect! It makes enough for about 3 large pan pizzas or 10 personal pizzas (depends on how you divide them up). Also it freezes well so you can make a big batch and then freeze them. 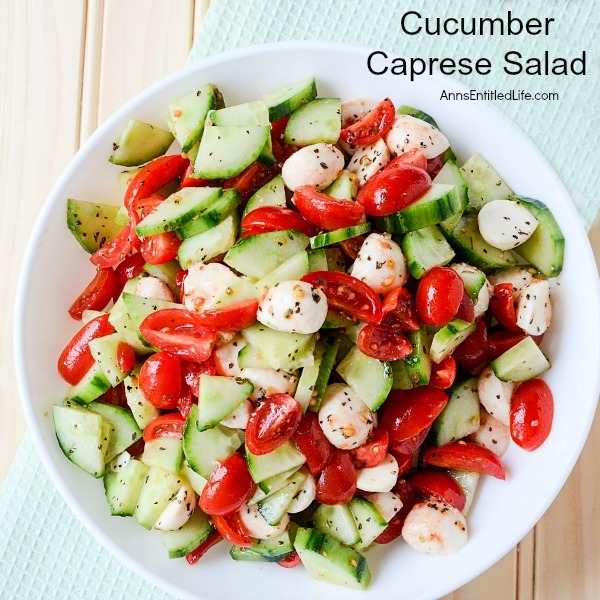 Cucumber Caprese Salad via Ann’s Entitled Life: This is one of my husband’s favorite side dishes in the summer. It’s a light choice but flavorful and pairs well with a Mediterranean style dish. Usually this is a side I’ll make for him when he’s grilling out fish or chicken. Be warned though the recipe makes a lot!!! I typically will half the recipe for us. And for one more bonus recipe…..Banana Nut Bread. I found the below pic floating around on Pinterest. There is no link to the recipe just this picture which links to flickr. 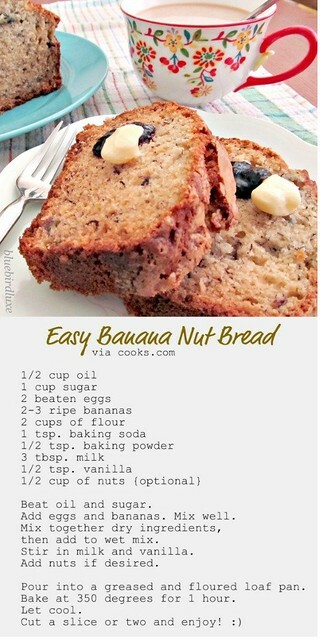 It makes the best Banana Nut Bread! I’ve even made it chocolate by subbing in a 1/2 cup of cocoa powder for a 1/2 cup of flour. SO good! Great for breakfast or a dessert. I put this recipe in a mini loaf pan and cut the cooking time to 20-25 minutes. Makes 8 mini loaves. Your turn! What recipes have you found to be winners on Pinterest? Share below Follow me on Pinterest for more ideas! OOoh nice ones! That first one looks especially tasty to me! We just found a recipe for this the other day in our mail! YES QUEEN. That vegetable soup sounds sooo good and so does that banana bread. I have such a problem with banana bread and by problem I mean I’m constantly craving it. Gimme, gimme! That banana bread recipe is super easy to make and comes out perfect every time. We make it at least twice a month ? I have an entire board dedicated to deserts on pinterest, I’ll have to actually try making them at some point! I do too Jo! One for desserts and one for recipes….I’m about to split that one up into types too. I have a lot of bread and soups that could have their own board ? Susan (Bloggin’ ’bout Books) recently posted…Top Ten Tuesday: Food, Glorious, Food! Baked pancakes? No way! Love your take on this week’s topic!! I kid you not Lisa! They are amazing and I’ll never make them the old fashioned way again. My husband said they are like the consistency of corn bread but sweeter and fluffier like a pancake. My son loves them!